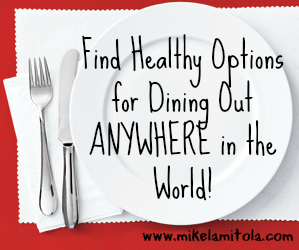 I want to share with you one of the most helpful tools to finding dining options all over the World that are healthy and actually taste good too: It’s called the “Happy Cow” website and it’s the best resource for dining out & eating on the road (especially for the job traveler). This website is a must have resource for any health conscious person. Just plug in your city and you’ll get all kinds of options. *A Note: The search caters to omnivores and herbivores alike. It might appear that the site focuses on Vegetarian restaurants but It’s really showing places that are healthier and offer vegetarian options. It’s been my experience that a lot of (not all) places that offer vegetarian options also tend to lean towards a healthier menu and that includes better quality meats and plenty of vegetables.